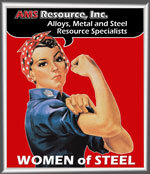 AMS Resource, Inc. is a supplier of Carbon Steels in a range of different grades, shapes and sizes. We have listed many grades with as much information as possible for reference, while we may not stock all of them, we don’t want to look like the “Sears” catalog of steel. If we do not stock a listed grades of material, generally if it’s made, we can find it. There are times that some material just isn’t available off the shelf. In those cases, often we have two options, we can assist in looking for an alternate grade that is more readily available or we can go to the mill and have it produced in mill quantities. 1074 / 1075 High Carbon Steel "Blue Temper / Spring Steel"
1095 High Carbon Steel, "Blue Temper / Spring Steel"